This month Gala introduces its Good 4 Me range, Intersport invite us to meet them, parkrunner of the month Andrew Hyland explains why he loves parkrun, and Bree Treacy from RTÉ tells us what’s next for Operation Transformation. RTÉ Operation Transformation has just completed its very successful ninth season with thousands of people across Ireland taking on the challenge of following their favourite leader’s exercise and food plan in an effort to live a much healthier lifestyle. Together the leaders lost 100lbs during their Operation Transformation journeys in a series that encouraged the nation to lose weight with the Million Pound Challenge, and get moving with a very successful partnership with parkrun Ireland. The initiative saw a trebling of the numbers attending parkruns on Saturday mornings and more than 15,000 new registrations since the beginning of 2016. Over the past nine seasons Operation Transformation has proved to be a very powerful tool for change in the health of the nation and this year RTÉ has pledged to keep the campaign going right throughout the year, in an effort to keep people motivated on their journey to well-being. For the next 12 months there will be regular updates on our leaders’ progress, new seasonal recipes and exercise plans and, most importantly, we will be keeping up contact with all the communities and groups who have been following the Operation Transformation plan since the start of the year. Operation Transformation will be found at parkruns nationwide, major national events, on RTÉ Radio 1 and RTÉ 2FM and on RTÉ Television. The Operation Transformation and RTÉ One Facebook pages, Twitter, Instagram and Snapchat will be updated with interesting and engaging content. We will continue to link with communities and the activities of our groups and recognise their successes throughout the year. And we won’t be forgetting to track the country’s progress in ditching the collective spare tyre for the Million Pound Challenge. With the help of our great partners at parkrun Ireland, Operation Transformation will be keeping the nation moving throughout 2016! Community convenience Group and sponsor of parkrun Ireland, Gala Retail, has teamed up with Unislim to launch a new healthy options range for its shoppers. Good 4 Me is a fresh offering of lunch options that are all under 400 kcals and taste seriously delicious! Created in conjunction with Unislim and with the help of Irish dietitian Paula Mee, Good 4 Me includes sandwiches, wraps and baps that you can feel good about, as they’re all less than 400 kcals and most importantly, don’t compromise on taste. 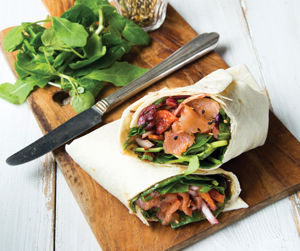 Bursting with flavour, the deli lunch offering includes fire-smoked BBQ turkey and spinach salad wholemeal baps; New York deli roasted beef specials and teriyaki smoked salmon and spinach wraps. Thanks to Gala and its Good 4 Me range, finding improved lunch options that are yummy, on plan and are convenient is no longer a problem. Initially being introduced into 20 Gala stores, Gala’s Good 4 Me range will be rolling out gradually in selected stores nationwide. For a list of participating stores, keep up to date with the Gala Facebook page. Say hello to us in store! Intersport is now officially connected to parkrun, and we would love to see you all in store over the coming weeks and months! Our philosophy ‘Sport to the People’ recognises your passion for sport, and the huge role that the community plays within sport and physical activity. Being part of the growth of new parkruns across Ireland is very exciting, bringing sport to the people together. We are passionate about sharing our expertise and knowledge, and you are guaranteed to get the best equipment and kit with the best advice. Alternatively feel free to just pop in for a chat and let us know how you did at your latest parkrun! Intersport stores are at the heart of communities across Ireland, and we are looking forward to getting to know you and to sharing your parkrun journey. Please visit www.intersport.co.uk for further information about Intersport Ireland and to find your nearest store. If you would like an event in your area and are keen to be involved please get in touch. We would love to hear from you. 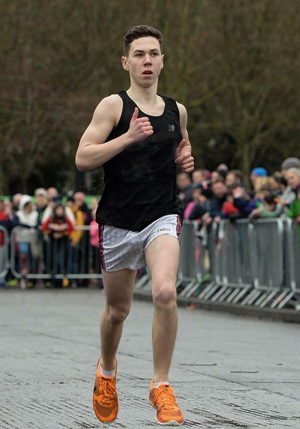 I recently finished my 87th parkrun at Naas. I never imagined in my wildest dreams that I would run 87 parkruns! The team leaders and all the volunteers at Naas are wonderful and they encourage everyone, young and old. The amount of new people I have met is fantastic and I look forward to parkrun every week. A huge thanks to parkrun Ireland. Has parkrun made a difference in your running or your life? If so, we would love to share your story. Pop us a short e-mail and we will publish a selection every month. Favourite volunteer role: Token sorting. I still get to run and it’s in the warm cafe! What do you do at parkruns: When I arrive I'll usually do a quick warm up to get ready for the run. Then after the run briefing I'll go to the start line and get ready to go. After the run I might go to the market for a cake or two before heading off to train again. How has parkrun changed your running: Before parkrun I did no running, but after my first parkrun I started to train more and more as the weeks went by and slowly got better and better. What do you like about parkrun: It gives you a platform to improve your running as you can see weekly if you’re improving. You also meet other runners of your ability who you can chat to and run with. Most memorable or funniest parkrun moment: Finishing in front of my running partner. We were neck and neck until the last 200m when I decided to make an early sprint! 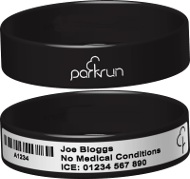 Printed barcodes are used at all parkrun events to record your result. No barcode, no time, no exception. To retrieve and print your barcode, click here. To order a barcode wristband, which can also include your name, emergency contact details, and any medical conditions, please follow this link. A percentage of all sales will go towards supporting the growth of parkrun in Ireland. 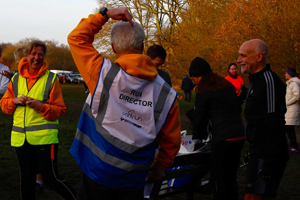 Every parkrun event relies on volunteers and in 2015 alone more than 6,000 of you came forward and supported your local event. Volunteering is a wonderful way to make friends, feel great, have fun and maybe even learn some new skills. If that sounds like it’s for you then please contact your local event team for more details. We welcome children at parkrun. Please note that those under the age of 11 must be within arm’s reach of a parent, guardian or designated adult of the parents’ choice whilst attending 5k parkrun events. Children aged 4 to 14 can run unaccompanied at our junior parkrun events. Framework for Improved Health and Wellbeing in Ireland. The National Governing Body for Athletics in Ireland. The Irish Sports Council plans, leads and co-ordinates the sustainable development of competitive and recreational sport in Ireland. Commercial Law Firm. Specialist Expertise – Strategic Approach – Sound Advice.